I went shopping today for new blue jeans. Number one, I have never enjoyed shopping. Unless I'm wandering around a bookstore (preferably used), then I want to get in and out as soon as possible. In order to accomplish this, I find one store that fits me well and buy everything there. I don't have to try anything on, and I can request gift cards for Christmas and birthdays. For about 4 years, this store was Lane Bryant. I knew what size and style to get there so shopping was a breeze. But for the past year or so, I've been dropping sizes like crazy and have shopped almost exclusively at Goodwill. I just couldn't spend more than a few dollars on something I might wear for a month before it was too big. I can be realistic with myself and accept that I will probably be this size until summer so splurging on a couple pairs of jeans (that I wear every day to work) is not a bad thing. Plus I requested an Old Navy gift card for Christmas. I chose Old Navy because they have a good selection of different styles of jeans, have sales fairly often, and there's one near me that's easy to get to and not in a mall. Yesterday I found a hole in the back of the one pair of jeans that fit me. So today, I went jeans shopping. Armed with my gift card, I headed to Old Navy with a lot of anxiety. I know that I have lost a lot of weight but sometimes I still think I'm the same size that I was before. On several occasions I bought something at Goodwill only to return it the next day because I had purchased a size too big. I have trouble accepting that I really am a size 10. Now, right next to Old Navy is Lane Bryant. I went into Lane Bryant first, picked up a pair of jeans that were the exact size/style that were getting snug on me before, and went to the fitting room. I could barely keep them up with one hand while I took the pic! I then entered Old Navy with a spring in my step. There was still a possibility that I wasn't actually a size 10...but I knew I definitely wasn't a 16! I tried on 4 pairs of jeans, all size 10s, 4 different styles. The styles are named Diva, Sweetheart, Flirt, and Dreamer. They all fit, and fit well! But these were my favorites. So I bought two pairs. Woo FREAKING Hoo!! You look amazing. I know what you mean! 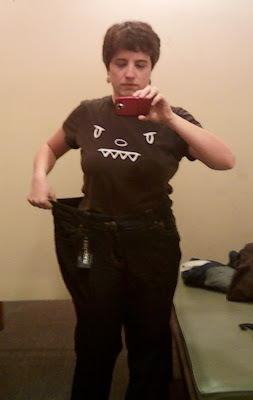 I lived in Gloria Vanderbilt jeans from Costco while I was shrinking. I think I had to replace them every three months, which sucked but in a good way. I'm now wearing my dream jeans: LEVIS! And in a size 6 (pinch me).